There’s an old adage that says ‘you’re only as old as you feel’, and there’s certainly something about the grey nomad lifestyle that makes people a lot younger than their years. The open road is full of grey-haired travellers living the Big Lap life to the full and with all the enthusiasm of teenagers. Septuagenarians Dave and Cynthia Herbert from Victoria are incredible examples. Twenty-two years of retirement has not slowed their appetite for touring Australia and, although Dave turns 80 next year, they still hook up their 19-year-old Gazal caravan each autumn and head off on five- or six-month trips. The couple has already done six full laps of the continent, as well as completing numerous half laps and shorter trips. “We’re having trouble finding new places to go,” said Dave, before hooking up his 14’ bathroomless rig. Last year, the pair did the unsealed 1200 kilometre Great Central Road/Gunbarrel Highway from Uluru to Laverton in Western Australia, then returned the same way. “We just wanted to see it!” said Cynthia, a super-fit former ultra-marathon runner. At the end of each trip, Dave meticulously strips down all the running gear of the van, right down to the spring shackles, and lubricates, repairs or replaces any dodgy parts. The only time either vehicle has let them down is when Dave accidentally filled the tug’s diesel tank with petrol! While towing a caravan around Australia would be adventurous enough for most nearly-80-year-olds, the avid cyclists still often punch out 70-80 kilometre rides when at home, and use their bikes to explore when out on the road. 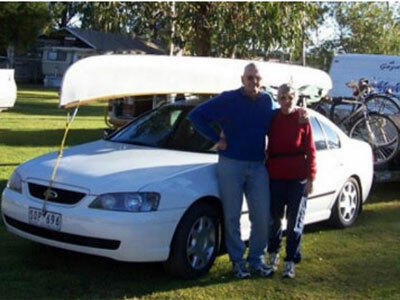 Although they have now reluctantly sold their 18’, timbertrimmed Canadian Canoe because it became too difficult to lift back onto the roof racks, the couple has also enjoyed some epic paddles. Some years ago, they paddled the length of mighty Murray River from the Hume Weir to its sandy mouth at Goolwa while camping in a small dome tent along the way. So, having done so much, when are the pair going to hang up their touring shoes? “Not any time soon,” they laugh. Absolutely fabulous Dave and Cynthia …my wife and I are in awe of your adventures, nothing short of green with envy. Safe travels for the future. PS hope to meet some day to share great memories.